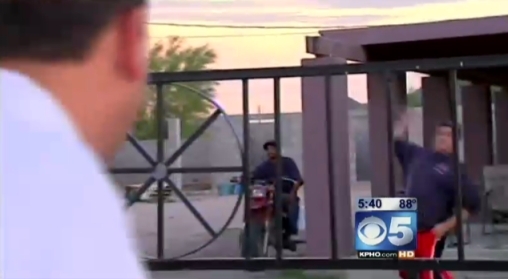 When a CBS 5 News crew went to the Torres house in Casa Grande to get his family’s side of the story, the brother of Frank Torres greeted them with a litany of profanity before they ever got to the yard. He refused to answer questions. When the reporter and videographer didn’t leave as quickly as he wanted, he picked up several large rocks and hurled them at the news crew, they said. The headline on the KPHO story said the “CBS 5 news crew accuses Casa Grande man of assault,” but the man was never arrested. UPDATE (Aug. 27, 2010): Our original version, based on the story on KPHO’s website, said the rock-thrower had been arrested. We found out Friday he hadn’t. This story has been updated to reflect that.